What would you do to rescue a special dog? Would you risk your career and even the dog’s life if it meant a better future for him? Craig Grossi found himself in just this situation. A Marine intelligence collector stationed in a remote part of Afghanistan in 2010, Craig found love in a stray dog and risked it all to bring the puppy home to America. Craig & Fred by Craig Grossi. 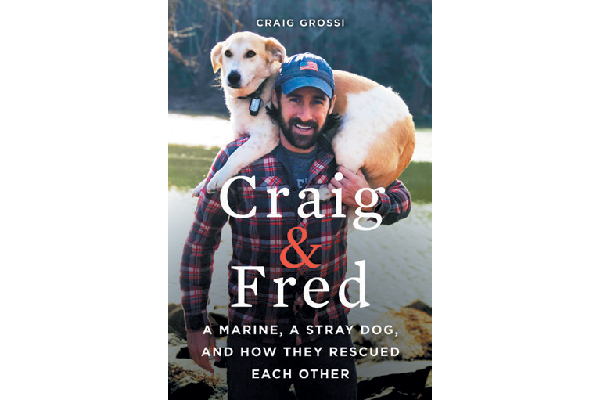 In his new book, Craig & Fred (Harper Collins, 2017), Craig tells how he met the puppy in a compound his Marine unit was occupying in Taliban country. Despite the constant anxiety of being fired at by Taliban fighters — or perhaps because of it — Craig found himself drawn to a stray pup who was hanging out within the compound walls. 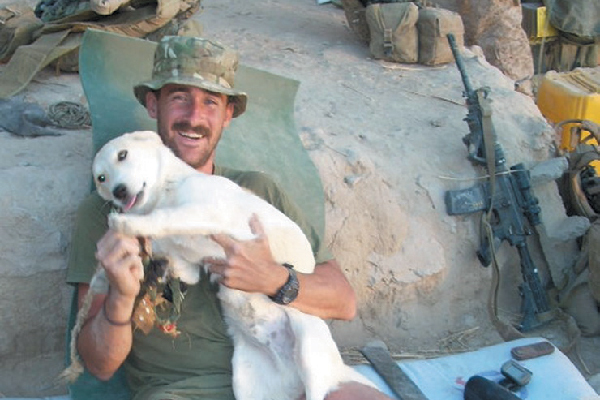 While most dogs Craig had seen in Afghanistan traveled in packs and ran from humans, this dog wagged his tail when Craig approached and gently took some food from his hand. A bond instantly formed. Craig named him Fred, and the two became constant companions. Fred soon made friends with all the Marines in the compound, taking turns sleeping with them and sharing their meals. How Craig Got Fred Back to the U.S.
Craig and Fred in Afghanistan. Photography courtesy Dave Moran. The story that unfolds as Craig tries to get Fred back to the U.S. is a nail-biter. Befriending dogs and bringing them on base was strictly forbidden. The consequences would have been harsh for Craig but even more severe for Fred, who would have been euthanized. Craig had to find a way to ship Fred to the States without authorities finding out. Fred made it back to the U.S. with the help of a number of people, many unlikely advocates for a stray mutt from Afghanistan. 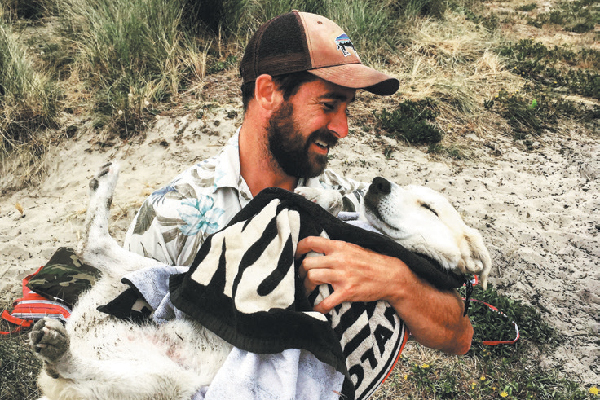 “They helped because they could see Fred was a special dog,” Craig says. Craig and Fred in the U.S. Photography courtesy Josh Tuohy. When Craig finished his tour of duty, the two were reunited back home. Both had suffered the ravages of war. Craig had sustained a head injury and was experiencing post-traumatic stress, and Fred was struggling with having grown up in a war zone with never enough to eat. But, the pair began to heal each other. Today, Craig and Fred tour the country, talking about their experiences and helping raise money for animal rescue. Thumbnail: Photography courtesy Josh Tuohy. Award-winning writer and editor Audrey Pavia is a former managing editor of Dog Fancy magazine and editor of the AKC Gazette. She is the author of The Labrador Retriever Handbook (Barrons) and has written extensively on horses as well as other pets. She shares her home with two rescue dogs, Candy and Mookie. Editor’s note: This article first appeared in Dogster magazine. Have you seen the new Dogster print magazine in stores? Or in the waiting room of your vet’s office? Subscribe now to get Dogster magazine delivered straight to you! The post How One U.S. Marine Rescued a Stray Dog From Afghanistan appeared first on Dogster.